Three families live in the seaside village of Frip the Romos, the Ronsens, and a little girl named Capable and her widowed father. 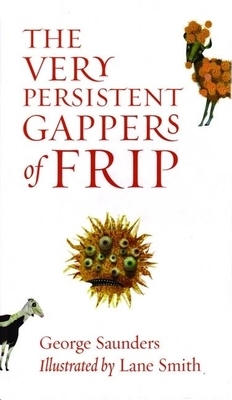 The townspeople of Frip make their living raising goats, but they must fight off a daily invasion of gappers, bright orange, many-eyed creatures that cover goats and stop them from giving milk. When the gappers target Capable's goats, the Romos and the Ronsens turn their backs on the gapper-ridden Capable. What will Capable do about her gapper plague? An imaginative tale by acclaimed author George Saunders accented with haunting illustrations by award-winning illustrator Lane Smith, "The Very Persistent Gappers of Frip" is an adult story for children, a children's story for adults, an oceanside fable for the landlocked, a fish story for loaves, and a fable about the true meaning of community.